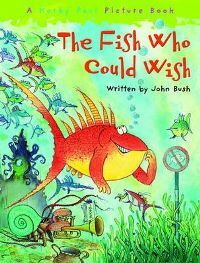 ‘The Fish Who Could Wish‘, written by John Bush and Korky Paul, is a fun little picture book aimed at small children but with a bit of a moral at the end too! The entire story is written in rhyme and takes place at the bottom of the sea where we meet a very unusual but lucky fish! This fish is different because every time he makes a wish it actually comes true! This fish wishes for all sorts of unusual things – for example a car and a castle, a horse and a Spanish guitar. Quite an unusual set of wishes you may think, but they all miraculously appear. One time he wishes he could ski and all of a sudden the ocean bed is transformed as it snows for a week! Another time he wishes he could fly and then is transported to flying all around the earth – twice in one night! So as you can see, all this fish’s wishes, however weird and wonderful, all come true. One day though, the fish, who is rather silly, wishes that he could be just like all the other fish in the ocean. This wish comes true as well, but of course all the other fish can’t make wishes that come true! So, from that day onwards neither can our special fish either! So, I would say that the moral of this tale is to be careful what you wish for! As I said earlier, this story is written entirely in rhyme which definitely adds to its appeal. My daughter loves rhyme as she is very good now at recognising it and can complete the rhymes which she loves to do with this book. The rhyme also makes you read it with a certain rhythm, also adding to the enjoyment. The story is also a clever one and it’s very entertaining to see what the fish will wish for next. You can also make up your own wishes for the fish and say what happens when they come true. My daughter also loves drawing and likes to draw pictures to the wishes too! This brings me on to the illustrations which are fantastic! Korky Paul is the illustrator and provides so much detail in every picture and with a lot of humour too! Every time we look at the book there seems to be something new to look at in the pictures! He also introduces the idea of thought bubbles in his pictures with every time the fish wishes for something new there is a stream of bubbles blowing upwards from his head! So overall I feel this is a very good book for parents to share with young children. We love the story and the illustrations and enjoy thinking up our own wishes too! One Comment on "The Fish Who Could Wish"
I bought a copy of The Fish Who Could Wish while browsing for reading material for my then 5 year old son, because I was attracted by its lovely illustrations and the easy rhyming structure evident in the first few pages. I didn’t read it in its little entirety until we got home., waiting until we had settled in at bed time for our traditional read. So, on I read, happily and easily enjoying the adventure, but was taken QUITE aback by the sudden and sad end! My son and I looked at each other simultaneously dismayed and a bit uncomprehending of the unexpected twist in the tail of the tale! We talked about it for a while and in short order I had the “AH-HA” to deliver……When you know what is different and special about you, it is important that you enjoy and celebrate it! Don’t ever try to be “ordinary” or the same as everyone else. Use your special gifts and enjoy all the amazing places that being “you” will take you. What an awesome message so unobstrusively hidden in this little story. We will treasure it always…. I’m not quite sure where it is right now, but I am confident that it will emerg in the next round of spring cleaning. My Russell will be 11 years old in 45 days and being his Mom has opened up an amazing world of discovery for me. In trying to be a source of awareness and access to knowledge for him, I learn and re-learn a treasure trove of insights every day and in some of the most unexpected places – like a little book about a fish who could wish. He is the most awesome gift I ever recieved, and I celebrate how special my life is with him in it…….